St. Gregory of Nazianzus (c.325-389) wrote three types of work: poetical (including epigrams, epitaphs, and epistles), prose epistles, and orations. Gregory is widely acknowledged to be one of the finest of all Christian orators. His orations were collected in various combinations, and were fairly commonly found in monastic libraries. 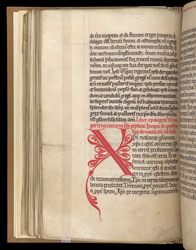 This manuscript has ownership inscriptions of the Cistercian Abbey of Byland, in Yorkshire. The second oration is introduced by a fine letter 'X'. The use of a single colour, and the absence of gold or figures, is in accordance with Cistercian rules laid down in the earlier 12th century.